Home » Foreign Forces » Opinion: Iran’s Atlantic Adventure Little Threat to U.S.
Opinion: Iran’s Atlantic Adventure Little Threat to U.S. The Iranian “fleet” reportedly heading for America’s “maritime borders” consists of two ships, the Islamic Republic of Iran Navy (IRIN) frigate Sabalan and the supply ship Kharg. An examination of some of the media hype and a few of the facts will reveal that this voyage is low in threat and rich in symbolism. He added, “Down the road it could be a threat.” Clearly Bolton’s words are intended to strike fear into the hearts of those that are convinced that Iran on its media-hyped maiden Atlantic voyage is presenting a legitimate blue-water threat to the United States and add to the arguments for a more muscular response to Iran’s nuclear ambitions. One must guess that Bolton’s “down the road” comment means the day when Iran develops an ability to launch ballistic missiles from a 54-year-old frigate, or a 37-year-old oiler. Yes, that would in fact be “down the road,” so far in fact that a vantage point in space would be needed to see it. Bolton’s comments unfortunately offer little in the way of substantive facts or analysis on what this voyage is really meant to accomplish for Iran. Or, more important, what, if anything, it should mean to the United States. Considering that Carney has access to daily White House briefings from the president’s national security team, his comments may indicate that this is so insignificant that it hasn’t bubbled up to category of “important news,” or it may indicate that what the Iranian Fars news agency has been reporting is bluster for the consumption of the home audience. From the middle: Where the empirical facts can be examined without the political noise, here’s what we know. If the IRIN is really venturing into the Atlantic, this would represent just the latest in a string of voyages that the IRIN has conducted. In March of last year the same two vessels of the “fleet” sent into the Atlantic visited the China’s South China Sea port of Zhangjigang. In 2012, two different IRIN warships traveled to the Mediterranean Sea via the Suez Canal. Thus, the Atlantic voyage is the final piece in Iran’s demonstration of naval legitimacy and its increased engagement with its allies. A good guess is that the two IRIN vessels reportedly in South Atlantic will enter into our backyard pond, the Caribbean Sea, and make a port call in Venezuela before returning to their home waters. One of the more interesting aspects of this story, which has not been reported, is the strategic communication intended by the sending of the IRIN frigate Sabalan. 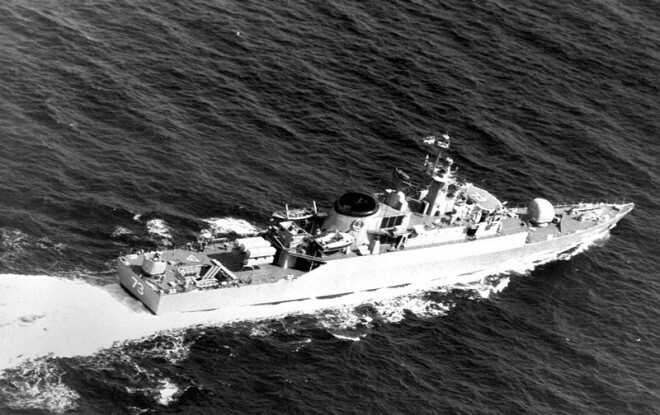 As many in the U.S. Navy will recall, this is the ship that was left burning and dead in the water on the afternoon of 18 April 1988 following the punitive attacks on Iranian assets in the Persian Gulf known as Operation Praying Mantis. The Sabalan was towed to port and rebuilt. The sending of the Sabalan, when other, newer vessels are available, is perhaps intended as strategic message to the United States. Objectively, one has to admire the fact that this 54-year-old vessel, once burned and broken, now refurbished is making its second long-distance voyage in a year. That says something about Iran’s indigenous shipbuilding and defense industries. That is at least one valid point that U.S. Navy and American defense analysts should take away from this Iranian exercise in blue-water operations. Finally, this voyage is another milestone achievement for Iran. While it may not seem like much to the American audience, it is big news for the home viewing audience and serves as a source of national pride. The IRIN’s Atlantic voyage fits a recent pattern of Iran’s greater presence on the international stage. Some sources have suggested that this all is timed to coincide with the next round of the P5+1 talks scheduled for next week. The conclusion that Iran is rattling the saber before negotiations is reinforced by Iran’s testing of two missiles in its airspace earlier this week. In the final analysis it stands that Iran’s strategic communications are checked and matched every day by the formidable U.S. military presence in their home waters in Persian Gulf region. With that fact in mind, what type of reception should they expect if they choose to patrol America’s maritime borders? Article Keywords: Atlantic, Iran, U.N.